On the basis of several interviews that were conducted with SCNC representatives living in exile in the UK, it was revealed that the marginalized Anglophone community of the Southern Cameroon has been always subject to discriminatory policies and unequal treatment from the majority population. The southwest of Cameroon is an English-speaking corner of a Francophone country. Its population is one of many across the world that wouldn't mind drawing its national football team from a smaller pool of talent, if it meant that they were no longer associated with a government that continues to marginalize and persecute them. 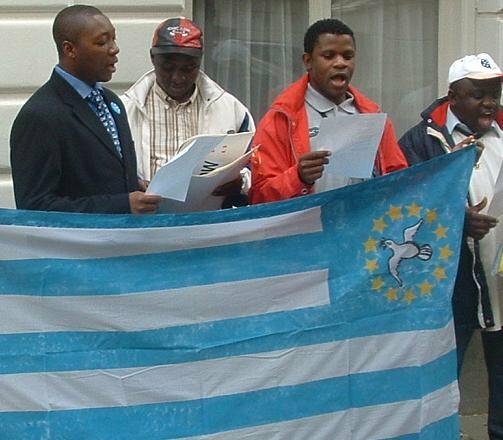 The Southern Cameroons National Council (SCNC) campaigns for the independence of this region from the rest of Cameroon. They feel pretty strongly about it, too, as evidenced by the fact that they haven’t given up despite being outlawed, tortured, and even killed for their membership of the group. Roger had to get out of Cameroon, and after a number of appeals and over two years in various detention centers, he was granted asylum in the UK. He misses his country but, far more than that, he misses his wife, who he said was raped and then killed by men opposed to the Southern Cameroons independence movement. The desire for an independent nation state goes back, predictably, to the end of empire. Having scrambled into Africa, the European powers scrambled back out, leaving a set of artificially carved up states behind them. French Cameroon got its independence in 1960 and then, on October 1, 1961, the time came for British Cameroons to be divided. The northern part joined Nigeria and the southern part joined French Cameroon. The formerly British area of the country had its own autonomy as part of a federal Cameroon at first, but in 1972, much of this autonomy was removed by the government of Ahmadou Ahidjo, which pushed through the replacement of the federal constitution with a unitary one. In 1982, Paul Biya became president of Cameroon and over time he created a one-party state, centralizing powers. In the early 90s, he accepted the introduction of multi-party politics but managed to hang on to undisputed power. He is still president today, winning elections against a divided opposition, amid deep voter apathy and accusations of vote rigging. “Biya probably does rig the vote but he would probably win if he didn’t because the population has so little faith in the political system,” a Cameroonian journalist told me. It was in the early to mid-90s that Biya’s government really inspired the movement for an independent, Anglophone Southern Cameroon. In 1995, SCNC was founded and in 1996, Anglophone Cameroonian groups had their requests for greater autonomy written into the constitution. That sounds like progress, but none of these requests have been implemented and Biya has since declared that the SCNC is an illegal organization. In return, the SCNC refers to Biya’s government as an “annexationist regime.” Last year, over 100 suspected activists were arrested in a sweep of the town of Buea, including the SCNC’s vice-president, Nfor Ngalla Nfor. Members of the SCNC told me that these arrests often lead to the torture and sometimes killing of their members, something that is largely ignored by the UN, the US, and the former colonial powers, France and the UK. Roger told me, “We don’t need any dictatorship in our country and we don’t want our people to be in prison any more.” Alain Mbock, chairman of the SCNC in the UK, said that that he wanted “the entire world to know what English-speaking Cameroonians have been going through for over 50 years.” He told me this on October 1, where he and a small but dedicated band of SCNC members had gathered to present a petition to the British government, asking that they support his organization’s bid for an independent Anglophone Cameroon. The date was significant—October 1 is when British Southern Cameroons became part of the Cameroon that exists today. For two hours, the SCNC delegation stood outside, chanting and singing, alternating between defiance and celebration. It was a strange sight, a group of people—all of whom had been granted asylum in the UK—thousands of miles from a home they might never see again, campaigning for an imagined home that is unlikely to become a reality. They drew confused, amused, or sympathetic glances from passing members of the public, almost all of whom were totally unaware that this independence movement even existed. Placards told the passing crowd that “Cameroon is a time bomb waiting to explode. The UK government needs to act now.” Act on what? You had to read the small print or know the context. A policeman came over, asked what was going on and concluded that a little bit of Southern Cameroonian independence chanting was alright by him. Alain Mbock showed me the petition he was presenting to the government just after lunch and seemed optimistic about how it would be received. The British, having played a large part in creating this situation, were being asked to get behind a potential solution to it. There was a more pressing, immediate concern as well. “I would like the British foreign office to persuade the UK government not to return SCNC members back to Cameroon once it has been determined that they are members of the SCNC,” said Alain, who fears that members of the group who are returned to Cameroon will be tortured and imprisoned. That didn’t seem to address the thorny issue of the torture of members of a political group, but it was no more than could be expected. Cameroon is looked upon by most western governments as a relatively stable place. The thinking seems to be that while it’s not ideal that Biya has been in power for over 30 years and that his regime seems to do some pretty bad things to a small minority of its population, he may as well be left to it. And really, the last thing Cameroon needs is the British sticking their oar in again. The SCNC’s cause, though, has been born out of what they consider to be an intolerable situation. Their region has little power or control over its own affairs. The major opposition party associated with Anglophone Cameroon, the SDF, seems to be mired in the same apathy that has taken over Cameroon’s electorate. If southern Cameroon was given back some of its autonomy and if Biya stopped inflicting his iron will on the SCNC and its supporters, the organization would surely learn to live with the situation and might accept that independence wasn’t needed. As it is, southern Cameroonians remain the victims of what Amnesty International calls “grave human rights violations” and SCNC members languish in prison—or worse. Meanwhile, their exiled members in the UK worry that the British government’s increasingly hard line on immigration will lead to their comrades being sent back to the country they have fled, where they will be at the mercy of Biya’s men.